Your Solution to "What's for Dinner?" If using a frozen turkey proper thawing is essential. If your turkey is 12-16 pounds it will take at least a 4 to 7 days to thaw it in the refrigerator. You can speed up the process by submerging the turkey in enough water to cover the turkey. Be sure to change the water every 30 to 60 minutes. Once your bird is properly thawed, you will need to remove the package of giblets from inside the bird, then rinse out your turkey thoroughly. Now, your turkey is ready to be stuffed! My favorite way to stuff my turkey is with fresh fruit. I use lemons, limes, and oranges. I use fresh herbs under the skin like thyme, basil, marjoram, oregano, parsley, sage, or savory. I usually pick only three of these herbs. Once the herbs you've selected are inserted under the skin, rub the skin of the turkey with olive oil or butter. This will help the turkey develop a crisp, brown skin. There are many variations of stuffing (or dressing) to choose from. A blend of oyster, dried cranberries and nuts, bourbon and pecans, apples and fennel. My favorite is an old standard dressing made with dried bread cubes, onions, celery, apples and seasonings. Use chicken broth to moisten the bread, saute' the vegetables and apples, then add sage, marjoram, parsley, salt and pepper. Cover and cook at 350 degrees for 30 minutes, then uncover and cook until browned, about 20 to 30 minutes. Need some last minute catering help for your Holiday gathering? Call me today! Enjoying quality time and interacting during Holiday Gatherings ~ Priceless! Creating Innovative Dishes & Meals! 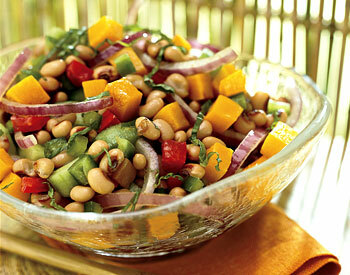 A unique and tasty combination of black-eyed peas and pumpkin with a lime based dressing. A great compliment to go with your leftover turkey sandwiches. "From the garden to your plate for all your events!" and can be used for any Service or Experience!